Possibly the easiest salad in the world, this incredibly healthy combination of iron loving lentils (37% DV! ), fiber-ific fennel and a-mazingly delicious artichoke hearts all tossed in a drink-from-the-bottle red wine vinegar salad dressing that will have you wishing there was more salad to go around! The best part? 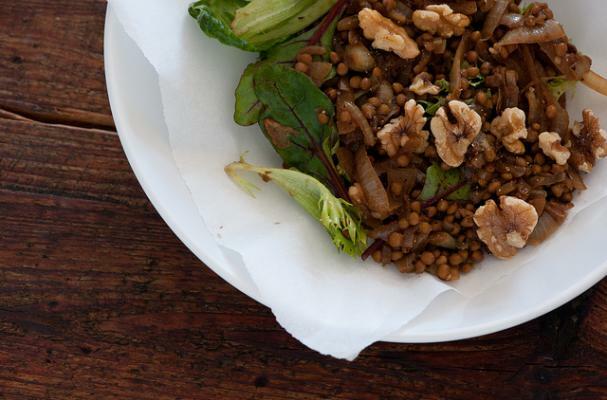 This recipe is so incredibly easy you won't even know what to do with yourself -- 2 1/2 steps (if you count draining the lentils), this hearty heart-healthy salad is the perfect pick me up on a blustery winter's day. Bon apetit! Optional: serve salad on a bed of arugula for an even healthier meal! In a medium saucepan, bring water to a boil over medium-high heat. Add lentils. Turn the heat down to medium-low and simmer for 20 minutes or until lentils are tender but not disintegrating. Drain and set aside to cool. While the lentils are cooling, make the dressing: whisk together remaining ingredients in a small bowl or pulse in a blender until well emulsified. Once cool enough to handle, combine lentils, fennel slices and artichoke hearts in a serving bowl. Pour dressing over lentils and mix well to evenly coat. Sprinkle with toasted walnuts, serve and enjoy!